Most of the gymnastics talk of the Rio Olympics has been centered on the American team and all-around gold medalist Simone Biles, but let's not forget some of the other incredible competing gymnasts — some of whom have their own amazing signature moves that they hope will impress judges during the event finals on Sunday. There have been rumors that China's Shang Chunsong can do a quad twisting layout during her floor routine, but she has yet to be credited for it during competition. But if the 20-year-old does try the quadruple twist — and land it successfully — during a competition, the Olympic Bronze medal-winning gymnast will be the first woman to perform the challenging move. Ever. Shang will not get a chance to land it at the Olympics though, since she is only participating in the uneven bar in the event finals on Sunday. 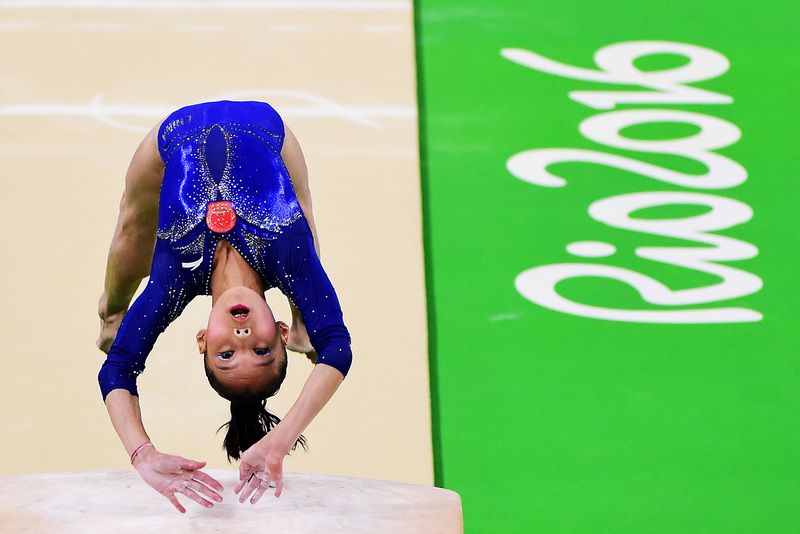 The Beijing resident has already mastered a three-and-a-half twisting layout on the floor, which helped Team China earn the silver medal in the 2015 World Championships. Earlier in the Rio Olympics, Shang's impressive skills helped her lead her country to a bronze medal in the team finals, and she barely missed medaling in the individual all-around competition, finishing in fourth place. In other words: even without that special move, Shang is pretty incredible. A full twisting layout is a highly advanced and difficult gymnastic move that often comes with other maneuvers in a routine, according to Livestrong, before twisting in the air. Shang's three-and-a-half twist means she's twirling in the air exactly that many times — so to land a quad would mean she would be defying gravity and twisting four full times. It would be an incredible accomplishment in gymnastics for female tumblers, showing that women can compete toe-to-toe with men in the floor exercise. The quad twisting layout was first achieved by a man when Kenzo Shirai of Japan successfully landed it at the 2013 World Championships, according to the Associate Press. He went on to do the quad twist in his floor exercise, according to The Guardian, and win the gold medal in the Olympics men's team contest last week. Watch Kenzo's full quad twist in action in the video below. But the move has yet to be accomplished by a woman. Rumors of Shang's own potential quad seem to have originally surfaced in 2014, with gymnastics blogs reporting that Shang had been working a quad twist for her floor routine for the World Championships. There have also been rumors that she's attempted it in competition, but if that's the case, it has yet to be credited and acknowledged as successful by judges. If Shang ever lands the quad twist and it gets counted, you can be it will be a great achievement both for her and for all women in gymnastics.